In developing countries, the recovery of materials from waste is mainly carried out by thousands of individual workers in what is referred to as the “informal” sector. This involves numerous risks, such as environmental pollution, health hazards and the cross-contamination of hazardous substances. In general there is a lack of quality and sustainability standards. The State Secretariat of Economic Affairs (SECO) has been developing knowledge partnerships in the area of e-waste since 2003. As part of the “Swiss e-Waste Programme”, Switzerland has supported India, China, South Africa as well as Columbia and Peru in their efforts to improve their e-waste management systems. Meanwhile, appropriate regulations have been enacted in virtually every partner country. These results have led to the development of a comprehensive approach in the form of the “Sustainable Recycling Industries” (SRI) follow-up programme. The development objective of SRI is the sustainable integration and participation of small and medium enterprises from developing and transition countries in the global recycling of secondary resources. The Programme organization includes experts in the eld and builds strong local partnerships with governmental organizations, industry and the civil society. Life Cycle Inventories: SRI develops basic data for the assessment of environmental and social life cycle performance for industrial activities through the improvement of local and regional expertise in Brazil, India and South Africa. 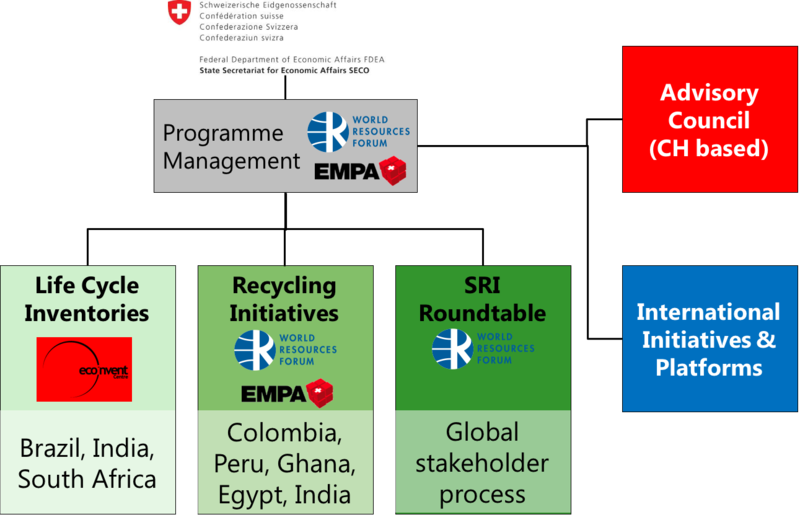 Recycling Initiatives: SRI improves local capacity for sustainable recycling together with private and public institutions, as well as the informal sector in Colombia, Egypt, Ghana, India, Peru and South Africa. SRI Roundtable: SRI facilitates a stakeholder consultation for the development of sustainability criteria for secondary materials. To have a general overview of the SRI Programme, download the SRI flyer.